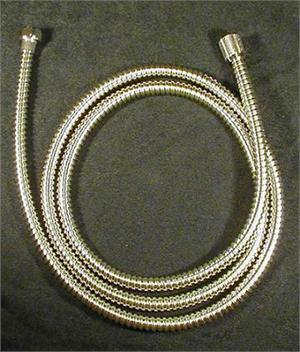 Upgrade your stiff or worn-out shower spray hose with one of these super-flexible chrome-finished hoses. The 60” hose is recommended for most showers. The longer hoses are sometimes helpful for those who sit down while they shower, or for shower heads that are mounted unusually high. Special heavy-duty white nylon hoses (not pictured) are for use when a very long hose is needed, that is more rugged than the super-flexible chrome hoses, and a stiffer hose is not objectionable. They are ideal when your hose will be used by many different people, or by a caregiver who is unlikely to treat the hose as carefully as you would. Also, it costs less, for folks on a tight budget. White nylon hoses are only available from us in 79 and 96 inches.